I had to chuckle loudly when I received this via email from one of my clients. 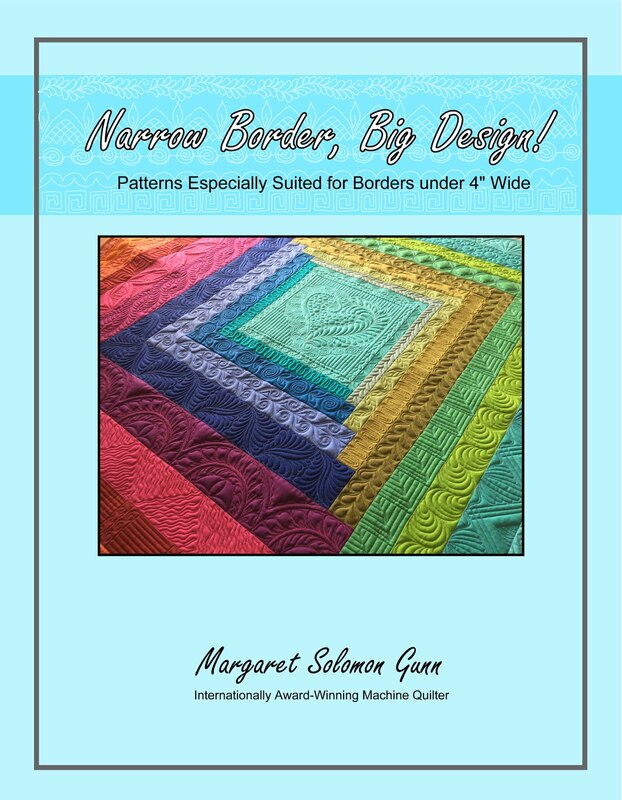 She's a great applique quilter, and has probably heard me rant about quilt quality and the grand multitude of anomalies that we as longarm quilters get to see. Most of these issues are truly minor. But now and then there are ones that make me really wrinkle my upper lip with bewilderment, and think long and hard how I will make it actually lay flat. Please, do have a look - It is funny, I promise! Funnier too because I had JUST finished this top and felt that rolled lip of disgust when I couldn't get that left side border to lay flat. It was my own doing and I knew exactly what was the culprit: My old sewing machine (of course it was not ME!!). My good Singer was being serviced. It has an electronic stitch width setting, so I can get great repeatability with my .25" seam. I borrowed my old (25 yr) machine back from my mom while the other one was gone, and it has 3 mechanical foot settings, so I guessed where to set it. I knew that it was just shy of 1/4" and hence the stoned middle border came out nearly 1" long. Curses. I did my best to reduce seams a little and ease it together, but it still ended up a tad big, and had that awful lettuce edge. 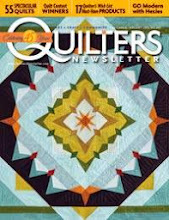 I am a better quilter that than and I was pretty mad. What else? I loaded it on the longarm and quilted it. And to my surprised eyes, it quilted perfectly. I didn't have to float the top, or use excessive pins, or even have to shout obsceneties and spit. It just quilted fine. Shock. Now I hope that this is not perceived as an invitation from all you out there that have D-cup quilts - I never suspected it would do this and i don't love getting quilts that are not flat. But, if you have ones with small imperfections and a little fullness here and there, do not fret. This is a Bento Box pattern which I have been working on writing up. It is strip pieced rather than stitched the traditional log cabin way which we usually make a Bento Box block. It requires many less seams and fewer cuts. On top of that, the blocks were done from a jelly roll and result in about only 1" waste per full 44" strip! Here's the link to my tutorial. I made this top in about 2-1/2 hours. I told you earlier in the month how much I LOVE this Moda OZ line. The fabrics are graphic and cheerful. This 60" quilt took just half a jelly roll, which I found for under $20, and 2 yards of ivory Bella. 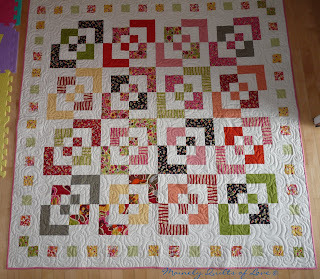 The backing is a rose Bella solid, and it took 3 yards to back and bind the quilt. Not being a fan of stippling, I chose a different and completely non-linear quilting design. 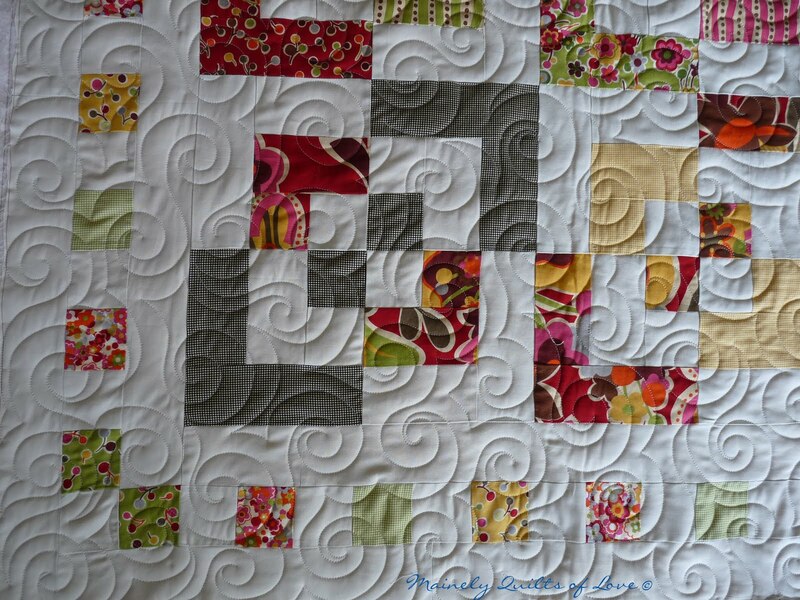 I think that juxtiposing a linear quilt with a non-linear quilting creates visual interest. If you find yourself in the mood to try a Bento Box quilt, consider trying this method. I am sure you will be surprised how fast the quilt makes up. I finished these two quilts recently. I finally dug into some of the green and browns that I bought in May as well as some fabrics bought last fall. Don't ask why they need to sit on a shelf for 6 months before I dare cut into them. I had quite a few Tina Givens prints that I really loved, and got for a mere $3 a yard in October that I had not touched until these quilts were done. 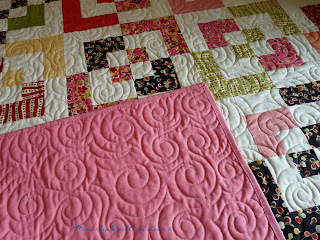 The initial concept from the quilts came from Oh Franson's Mod Sampler, but I added a couple blocks of my own and yanked a couple of her's that just didn't play well, and viola! The designs are simple, but it takes a simpler design to showcase the larger modern fabrics well. I am also a bit of a rebel when it comes to sashings. I know that white is all the rage amongst so-called modern quilt makers. But I hate it. No, I HATE IT (did you hear me that time??!). It's stark. Cold. And just plain impractical for anything which will be used. Furthermore, if the fabrics contain off-white and ivory, why sash in white?? So, in keeping with my rebel ways, I sashed the green quilt in ivory Kona and the brown sister-quilt in a soft butter yellow. Yellow is unorthodox, but it coordinated better with the prints than the ivory did. Just call me Jesse James. 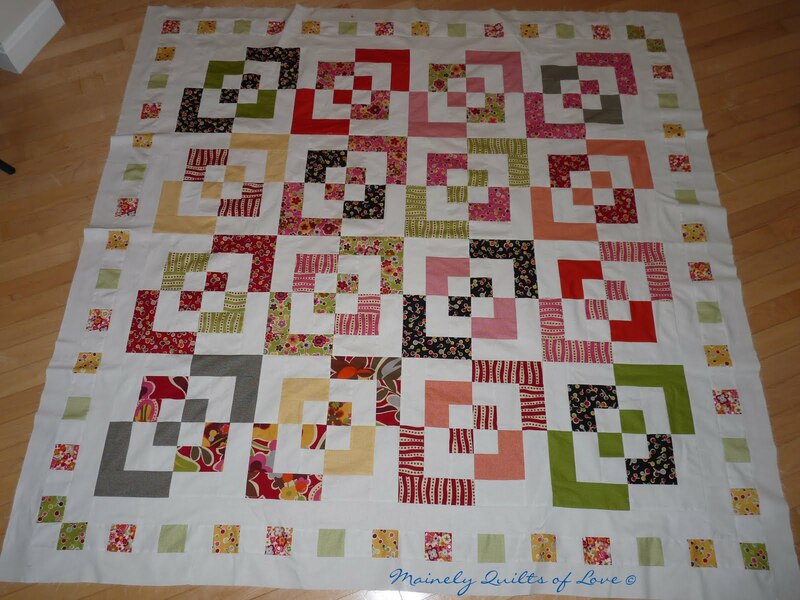 Initially, when I was making the blocks, I was very uncertain about the green quilt. I didn't like the blocks together much. But then I added about 6-8 new fabrics, pulled out 4 blocks, and it was love at first sight. The 5 Moda Bella solids I used with all of the bright, happy modern green prints are simply devine. I'm not really sure I can sell this one, but time will tell! And for those of you who do not or hae not used these solids, they are heavenly. I just love the Bellas - loads of colors, great weight, and a good price. On the green quilt, I tried out a newly acquired panto called "Windblown" by Jodi Beamish, which again, I was not sure of initially. It is densely quilted, and took longer than I really wanted, but in the end, I like the texture. And you all know how I hate stippling, so I needed an alternative. And the brown twin quilt, has another new panto pattern called "Whirlygig", by the same designer. It quilted up quickly and looks nice too. This pattern will get used frequently. Some detail looks... I did throw in a few aqua and brown blocks just for visual interest. They weren't quite right on the green quilt, but seemed OK for the brown. And the backs. Who could forget the back of the quilt?! 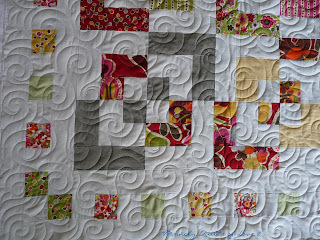 Brown quilt... a Michael Miller brown and lime green check with a stripe of my favorite large flower by Tina Givens. I managed to get the brown check at a Linus quilt event in March, four yards for $4. What a steal! I almost never buy enough backing fabric to do an entire quilt back of the same material. And the green sister quilt... It has the same Free Spirit Annabella flower and brown check, and I threw in some of another material from the Annabella line (green with yellow globs). 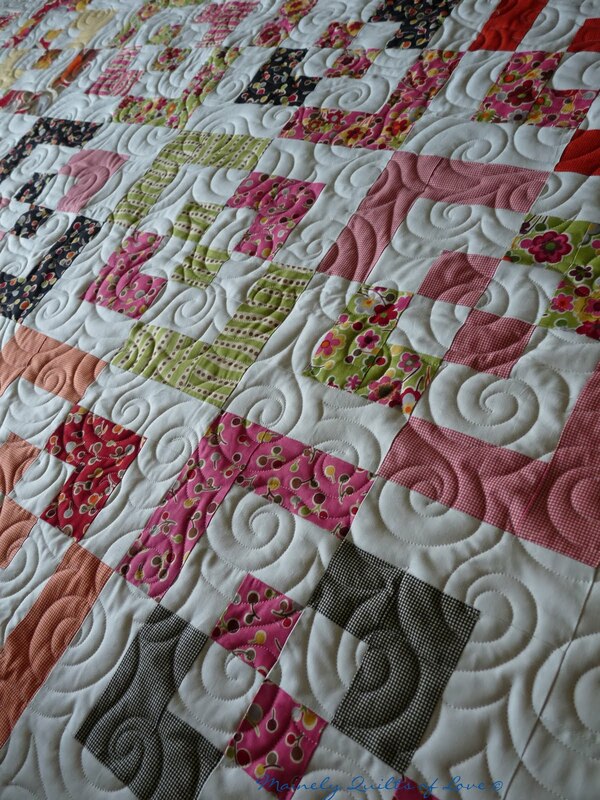 I also bound this quilt with this fabric, perhaps a little risky move, but it turned out wonderfully. So now, with little more than a week before I switch into beach vacation mode, I am busy wrapping up a couple more of my own selfish little projects. I am furociously designing several projects to stitch with newly purchased material, and scheming as to how I will utilize some older (AKA 2008-2009) fabrics. I have a few finishing touches to make on my Maine Quilt Show piece, which must be delivered the weekend after we return from vacation (so it has to be essentially complete when I leave). I have a great tutorial I will share next week. And I will put one more quilt to the LA before I take some much needed R&R. Take some time on your porch swing this weekend and enjoy summer~ I know I will be. This is a quilt that was made by Michelle and quilted by me last month. It's larger than the picture leads you to think it is - about 60" square. I was intrigued about the voile fabric right up until the point that it actually arrived in my mailbox. Then the fear set in. This was thin, almost sheer, and definitely silk-like. What on earth was I getting myself into?? The prints are from Anna Maria Horner, and are very pretty. The backing is fromn the blue floral print, which I really like. But the quilting was a scarry job. I ordered a blue-gray thread to best match the background. I knew I had one chance to quilt it. There couldn't be any ripping out or else it would show. And if I wasn't already scared of how this fabric would tension, Michelle sent a super thin QD Select batting which is essentially like a layer of thick flannel. All the longarmers out there know that tensioning is easiest when the sandwich is thicker. No luck with that here! 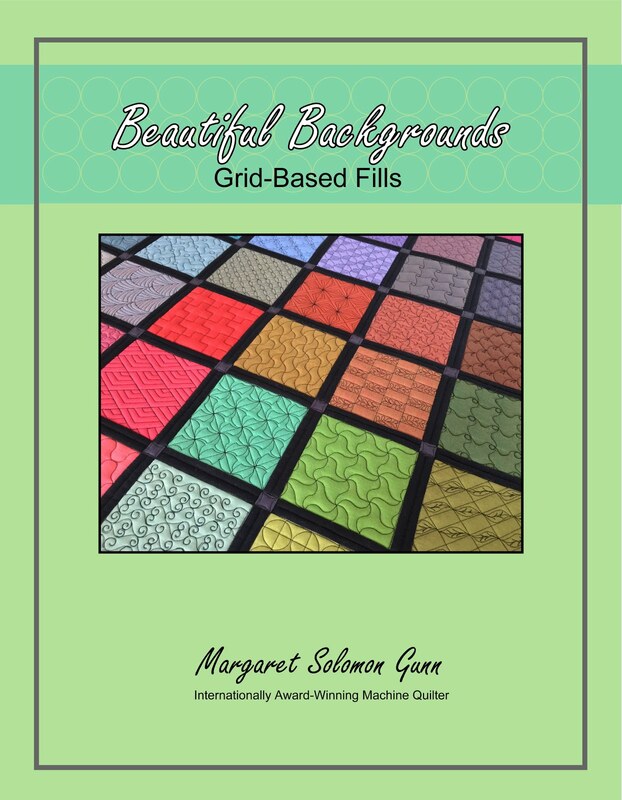 She wanted simple quilting that would not minimize the drape of the material. I really wanted to quilt the star differently from the background, but again, she requested a simple all-over pattern so my job really was just to get it right the first time. With 2 months to spare, her birthday dress is completed. She changed plans on me after I'd cut out the smocking section. Originally we were doing a ruffled skirt and shirt, but then she became very adamant about it being a dress, one-piece! SO...I had to get creative as how to put this thing together. She's all about being fance (AKA Fancy Nancy), loving ruffles, trims, bows, etc. If it twirls out three feet, all the better. I am hoping to find or make her (or better, have someone else make her!) a play dress up wedding dress for her birthday! Initially I was going to do a peasant-style skirt out of 4 or 5 coordinating fabrics. When I got to putting this together, it seemed out of place. Consequently, I have several extra ruffles made! Luckily, we bought plenty of fabric to do this all in just one. Very simple smocking since the fabric is busy. And under the layers of ruffling is a ribbony fabric. And she's twice as happy because I came home from Target with these new sandals for her - her first ever. They are still hard to walk in, but she loves them all the same. They'll be perfect on the beach. We are finally having a nice summer heat spell, even if it only lasts 2-3 days. It was hot back in late April, but not much above 65F for all of June so far. For me, this is most welcome. I love the sunshine and heat. And if it means you can go to the beach (because kids are now out of school), all the better. Mind you, the ocean is still a very brisk 52F, which is too cold for even my toes, but there were some crazy fools (my kids included ) that went into it. I blew it all off today. No house cleaning (ha, like that really happens regularly!). I sewed for an hour before the kids got up, but payed no attention to getting home by Sophie's normal naptime. I'm fried today. I have quilted the past 2 days with a malfunctioning thread break sensor. It beeps continuously, and is just about enough to drive me mad. A techie is coming some day next week to investigate the issue. In the process of bringing my LA to have the tensioner discs reinstalled on Wednesday, something was moved out of whack (or busted) in the disgnosing we were doing on the machine the day before. They checked the machine out w/o the computer on Wednesday so they didn't hear the continuous beep. I have done 2 quilts with it beeping and it's enough to make me crazy! So, today is all about playing. We are heading to the white sandy beaches of western Florida in just a few weeks. I am so looking forward to soft, white sand and not the dark and dirty, rocky beaches that we have here. It was low tide much of the time we were at the beach, so this is about as long as the beach gets. And it's always wet, so I couldn'y lay on my towel. To have been on dry sand would have meant allowing these two not-so-trusting cherrubs free reign to do whatever because I'd be too far away to do anything about it! Furthermore, with three on one, I cannot take a snooze or daydream. They are a full-time job. Or these two are anyways (AKA Trouble One and Trouble Two). Miss Sophie reassures me every day that I am her favorite Mama. Watching her is easy peasy. After several hours on the sand, we took a walk on the rockier area of this state park, exploring some of the tidal pools. They found several of these little guys! In retrospect, we should have done it first, when Sophie's feet were fresher, but then. It was fun. I'm so concentrated with getting her feet & legs strong enough to visit Disney, any exercise whenever in the day is a good thing. And I'll leave you with my favorite shot of the day. Sometimes the best picture is taken from behind . As my last post mentioned, my piecing machine crapped out last Sunday. I had it ready to take into the shop yestterday, but decided at the last minute I'd bring it in today. That gave me this week to do longarm quilting I had been accumulating, as well as a couple of my own quilts that have been lying around. It all seemed to be going according to plan. I finished 1 customer quilt Monday afternoon. On Tuesday morning, I put on one of my own quilts, as I knew it'd be a 1-day job, and then I could get back to business. I finished that in the afternoon yesterday and proceeded to put on another customer quilt. Not a large one, but one I could finish in a few hours. 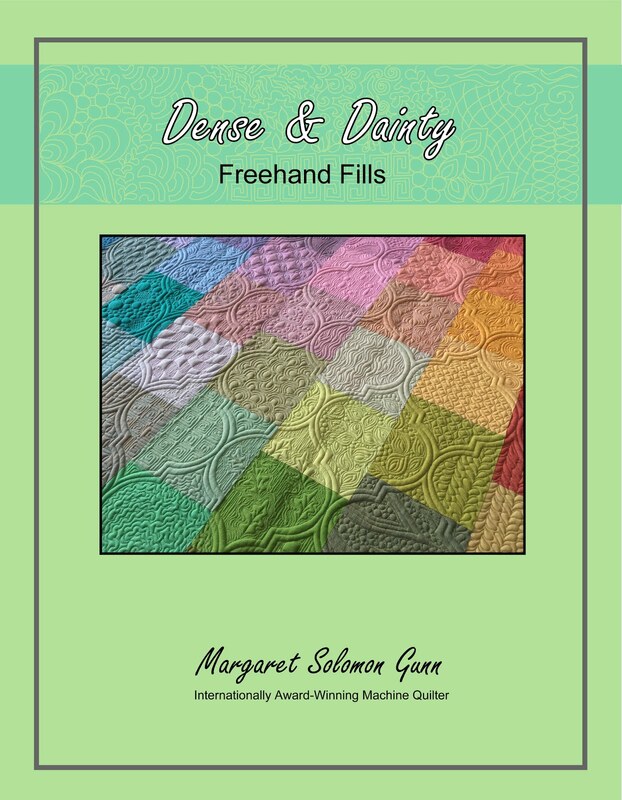 Basic E2E quilting. Threads on, quilt top basted on, and I started checking tension when the entire tensioning assembly fell off! I nearly sh^&!! I spent the next couple hours ignoring my kids, on the phone with the company and my local rep's technician only to get nowhere. I needed to take it into the shop. Sigh... At least I had postponed taking the Singer in so I only had to make one one hour trip (each way!). It was a simple fix, only took a few minutes, but now my baby is in the back of my car and I cannot sew this afternoon because I cannot safely carry it to my studio. There'sno point in risking it, so I wait unpatiently until my husband gets home. More realistically, I sit very impatiently. So what's a gal to do when she goes to Sanford, ME ?? (Besides laugh at being in one of Maine's "holes")...Go to one of my favorite and cheapest fabric haunts: Mardens. You are looking at 18 yards of fabric, purchased for $52. It is all good, namebrand fabric. I am uncertain who made the solids, but they are nice materials. They had about 12 different shades of orange - I had to slap my hands after grabbing 5 since I didn't have a plan for any of them (and it was apparent I had exceeded my self-imposed 10 yard limit). I have already started designing a quilt for the pinks above. I just LOVE the polka dots. The stuff above is Maywood Studios (Back Porck Bouquet). These are not enough alone to make a quilt, but they were very appealing to me. A small print modern! Before the Sewing Machine Crisis week started, I finished quilting this commission quilt for a customer. I'd done a similar quilt last year using swap blocks, and she wanted a similar one. I had to be crazy to take this project on - It has about 350 different cut fabrics. It is a fun I-spy type quilt though, and is almost like a memory quilt for me to see all of the different materials I have used in things over recent years. I did a mini-round robin over the course of the last year or so. My quilt came home yesterday. I started with the pieced star in the middle-left. I'd honestly hoped for a summer-y quilt, with flowers, watermellon, ants and other motifs of summer, but you don't really get to pick these things with swaps, and not everyone reads your preferences. I'm not completely sure that they were sent along with the quilt at all. I mean, I sent them, but whether they went with it the entire 16 months is unknown. Admittedly, it's not bad to have a July 4th quilt, but I'm really on the fence about "Old Glory" and the eagle. Like I have already said, I am a bit of a bitchy mood, looking for things to fuss about. Hey, let's start with the fact that school got out today and now I have 3 kids at home all day. I have already had whiney, hitting and bad attitudes from my 8 year old - the one who CAN really behave, but chooses not to sometimes. But really, this swap left a really rotten taste in my mouth. The person I sent to each month bitched publically on the forum about me if I sent my piece out more than 1-2 days early. She bitched at me when I sent a label separately (it was sent to me separately and late!). And then at the end, she went around me and had the person who would have sent her quilt to me for binding, just send her quilt to her directly. What the hey, did she think I couldn't put on a binding?? So annoying. Yes, I know some people in the swap will read this and I don't give a frig! I don't intend to do this swap again. The quality of the quilt is good; it's the one person that made it a bad experience. Late last week I finished a quilt for Lisa's son. She's such a marvelous piecer. I know when she sends things that they will be neat and square. And these fabrics are to die for. Gorgeous! I couldn't tell if they were batiks or a hand-dye she did. They are Hoffman "Mckenna Ryan's Silent Inspirations" - and the purple is all one fabric which has gradations from deep burgundy all the way to the soft pink. The blue and green are one also. Her son has wicked grand taste in fabric and in colors. I'm so glad I wasn't quilting some sports fabrics :-) Golly, quilting for boys and men can be SO challenging sometimes! Not this time. She gave me free reign to quilt however. 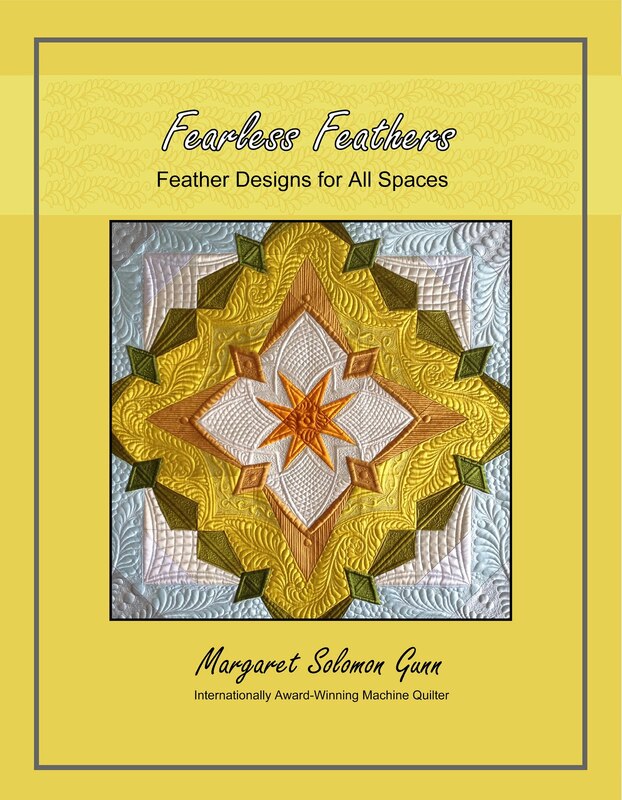 Her son likes the detailed quilting and feathering. It was hard fabric to quilt on because the feathering backtracking stitches show on so much of the purple (if not done carefully) because the fabric changes color. Normally I select a thread that nearly perfectly matches the material when I am to feather an area, but that was impossible here. I chose the rippling water quilting for the blue/green areas to counter the swirling that I did in the purple. To me, this is like "sea and sky" where the purple is the sky or wind. The centers of the plum areas have circular feathered wreaths. On the sides they are only semi-circles. The back has amazing texture. I can only imagine what it'll look like when its washed. It has already arrived to it's new home and is appreciated. Lisa and I have been blogging and swapping together for a couple years. She's done some of the swaps I have hosted, and we have been in others together too. Besides being a really good piecer, she's got a fantastic heart - often sending pieces of fabrics along to me just because. I really wanted to quilt this quilt nicely for her. A couple months ago, before Sophie had her surgery, she emailed to say she was having a dress made for her. We got it about a month ago, right when Sophie got her casts removed. It is SO her color - that coral-ish pink. Or maybe I should say, it's the color I think Sophie looks really good in. Personally, she'd rather be in 16 shades of garrish hot pink herself, but that's my girly-girl for you! Anyhow, the dress she sent was crocheted for us, and it is darling. We will definitely take it to Florida next month, and are waiting for another roasty-toasty hot day to wear it again. Tell me this little angel couldn't sell patterns for this dress?! No, not my cat (slight sinister grin...!). And there's no long lost (and wealthy) relative of mine that has met their demise. I'm just not that fortunate. I'm talking about my trusty sewing machine. My small machine that I do all my piecing with has a problem. I was pushing her this weekend to get a few projects finished up so I could quilt them, and it may have been too much. Tomorrow I have to take the machine for servicing and get my older machine back from my mom's house for emergency sewing. I kind of permanently loaned it to her months ago when her dinosaur died. Mine, however, is only 3 years old, and despite having quilted at least 75 quilts with it, I am seriously hoping it has much more life left. I have had a terrible liking for greens lately. Seems much of what I am sewing has bold, modern green fabrics. It just makes me happy! I pieced 16 blocks for a project I will show soon, but not yet. And got a client quilt loaded up and ready to quilt tomorrow. Unfortunately, the only thing I didn't get to were Kellie's Fresh Comfort Bee June blocks...sigh...maybe I will still get them done before I leave on vacation in July. I plan to go get the old sewing machine next weekend. I need to check in on my dad, make sure he hasn't died of lonliness (that was definitely not my sewing machine's fate). My mother has been in Italy the last 3 weeks and has another 2 weeks before she's home again. OK, this cherrub has nothing to do with that title, but she was too cute in her many polka dots in front of my most fragrant roses. What will I do when she doesn't want to pose for the camera??? A client called last weekend. She had a rush job. It was a Christmas tree skirt. I thought it all sounded a bit odd, but heck, work is work. And a rush job just means a little bit more $$. The entire piece only took about 3 hours anyways. Turns out her son is getting married in a week and was feeling sour that his sisters had gotten their tree skirts and he hadn't. Mom was feeling guilty. This was fun. Short and sweet. 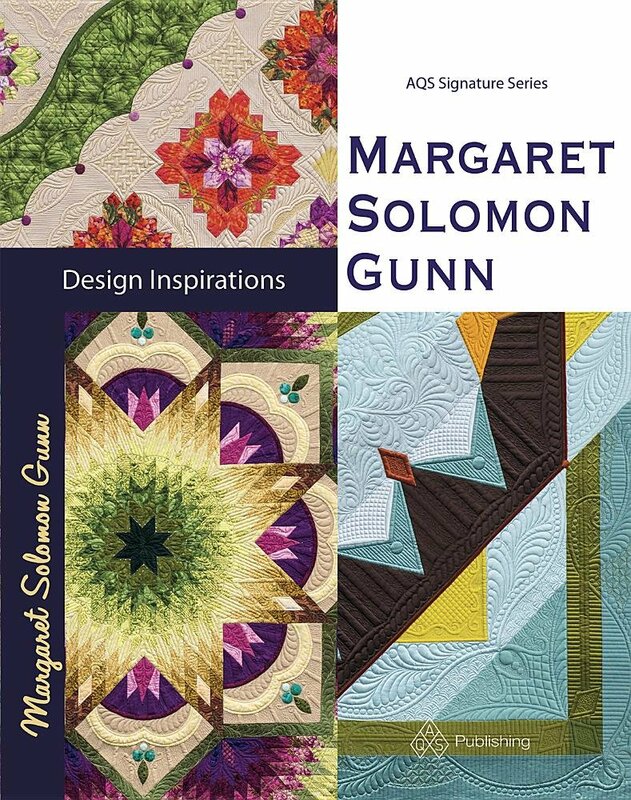 Except for the fact that I'd never quilted anything that was not square or rectangular, it all seemed elementary. Thank goodness for pins. Heck, I could quilt a circle! The skirts of the sisters were quilted with metallic gold thread. I refused to mess with that for the first time on a rush job, so I selected a polyester Rainbows thread for the red and tan areas. It had a nice sheen and looked festive & formal. Oddly, the thread in the dark green is only a sage green, and not even a Rainbows. It looks as though it is gold metallic! What dumb, blind luck on this one! I have pushed through several other things this week, in preparation for having kids home after next Wed. Oh, the school year IS too short!! 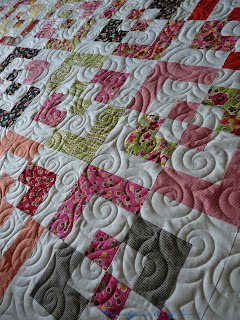 I have a commission quilt quilted and awaiting it's binding (as I think, "just a binding away from a paycheck! "), and two other quilt tops in the works for after I finish, hmmmm... ah, 4 customer quilts. Sigh...there won't be any breaks until I am in Florida in just 4 short weeks. And if there is magic or a God out there, I hope there won't be oil in Florida too (double sigh!). 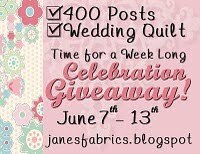 Go see Jane each day this week for a fantastic chance to win great things!! Here's a semi-modern quilt I did recently for a client. It is pieced in Moda's Oz collection. As soon as I saw this, I loved the fabrics. They are so rich and saturated, and the graphics are very simple. I'd love to find some yardage of a couple of the florals - they'd make fantastic dresses for Sophie. The client wanted a semi-allover pattern, and not to pay for true custom quilting. To make this task complicated, the backing is black! Black and white quilts for me are challenging since every stitch usually shows. I absolutely knew that because the top is white, using a bobbin thread other than white was out of the question. Every slight mistensioning would show. So black bobbin was never going to happen. I hate white areas stitched in anything but white too, so that was to be in white. The patterned pinwheels could be many different colors. I actually did stitch this mostly continuously, except for the outer patterned border. The pinwheels are sewn in continuous rows from one end to the other, and then returning with the larger size template. I did them last so I could sew from the top of the quilt to the bottom as well. Seems easy enough, but it was still about 2 hours to do because of it being template work. It definitely makes the design of the quilt though. Here's the back...The "ribboning" is in a grass green thread. It is very graphic with the backing being black. I think it would have been more my taste for the swirling to be in a more muted color, but that is for another quilt! It's really nice looking and the customer likes it. As a matter of principle, I rarely buy precut fabrics because the cost is astrononical per yard compared to buying them separately. But, I found this jelly roll for only $20 and couldn't resist. I have a quilt all designed and ready to make (soon!!). Ok, so this really represents much of my week's putterings. I did quilt a couple customer quilts as well but I won't show them until they are received. I always have the itch to piece. 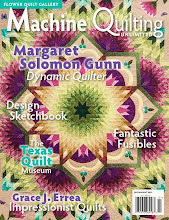 Seems that this comes when I have a ton of quilting that really needs doing. Right now, I have a couple customer quilts, a commisison quilt and 3 of my own that need to be done. But this is what I started on Thursday...there are only another 25 blocks (yes, only) to make. And then hope that all the triangles fit together well. I quilted this up this week. It's turned out not to be my favorite quilt. It has some great brown and aqua fabrics, but somehow it just does not make me sing as I hoped it would. Most of the blocks were from the Fresh Comfort Bee (see sidebar for link). The ladies did a good job, but it's just not me. Plus I pieced it wrong so it is axisymmetri and I was too lazy to take it apart. I did a different type of quilting, not just that average stippling that I see all over the Bee quilts. The aqua areas are done in a fun swirl pattern and the browns are in a free-form leaf. I intentionally tried to NOT quilt it with traditional (aka very neat and well formed) feathers. I like the modern look, just not when it becomes messy. I'm a bit disappointed in my thread choice - wish that I picked a slightly lighter shade of aqua rather than the deep teal. Oh well! It's all bound and destined to be sold (hopefully). Now to get some backings ready for the mod samplers I did a couple weeks ago. I also have a most unusual thing on my longarm - It is a rush job for a Christmas Tree skirt! I never envisioned quilting an octagon, but it looks doable! Oh dear, only a week and a half until the boys are out of school for the summer and I will probably be going bonkers!